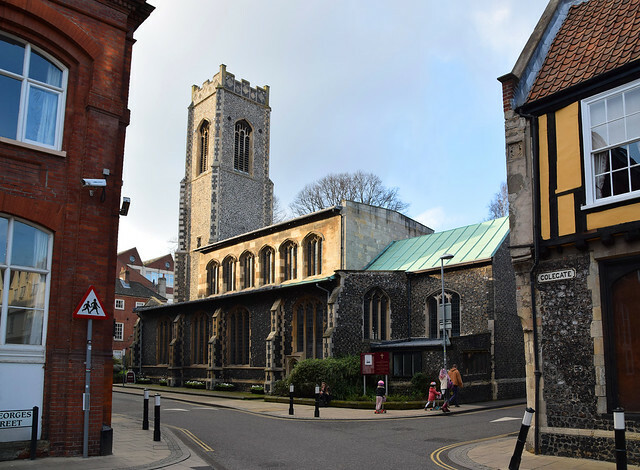 This area of the city centre, Coslany or 'Norwich over the water', is home to about half a dozen medieval parish churches, of which St George is the sole working survivor. This was one of the most intensely industrialised areas of Norwich in the Nineteenth Century, and the blackened flint of the walls still bears testimony to this. Now, the inner ring road is not far off, and the area is redeveloped with wine bars, law firms and loft conversions. 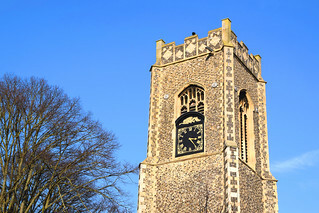 Norwich has consciously tried to develop residential areas in the heart of the city, with considerable success, and this has contributed to the feeling of St George being a living church in the heart of a community. 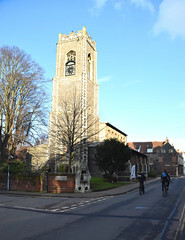 Although not as big as the likes of St Andrew and St Peter Mancroft, this is a large, determinedly Perpendicular church from the years when the Fifteenth Century was becoming the Sixteenth. 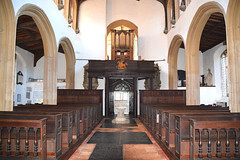 The tall, stone-faced clerestory marches determinedly eastwards, its windows as big as those in the aisles, but without the delicate 'wall of glass' effect typical of the time. This clerestory was meant to express grandeur and permanence as much as to admit rational light. Easily missed, but notable and worth seeking out, is the grand west doorway beneath the tower, obviously designed for processions. 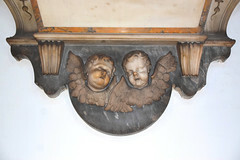 In the spandrels, you can see a paired scene from the story of the church's patron Saint. On the left, the princess and her family watch from the tower of their castle as St George neatly dispatches the dragon on the other side. Above, the eroded shields would once have borne sacred monograms, instruments of the passion, or even the crests of local worthy families. A surprise, then, to go inside and find that the vast, clear windows fill with light what is still largely furnished as an early Eighteenth Century urban interior, as if we were in the City of London. 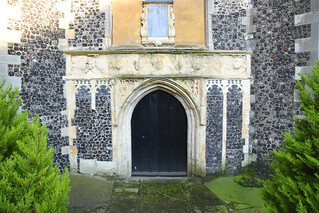 In truth, of course, just as central London was prosperous at this time, so was central Norwich, and what you see here must have been what many other churches in the city were like. Quite literally in fact, because St George is now home to many Eighteenth Century furnishings stripped out of other churches that fell to redundancy. Anyone familiar with the City of London's St Margaret Lothbury will recognise the same result here of a treasure house of the survivals of other churches. 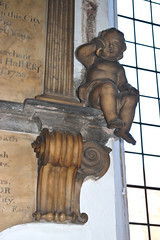 St George was almost derelict after the war, thanks to bomb damage and neglect, and so their fates really saved its life. Because of the size of the windows and the lack of coloured glass, the heavy dark wood is not hard to bear, the west gallery is not oppressive. The tiling of the floor is harmonious, the sheer white of the Fourteenth Century font a striking central feature. 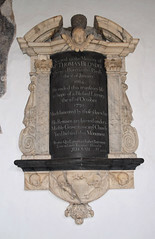 The font appears as if it has been cobbled together. 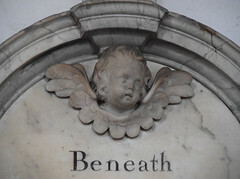 The bowl and shaft may be from different fonts, and the connection between is probably Victorian. It came from St Saviour, just to the north. 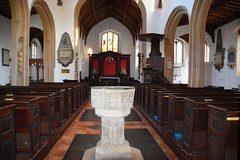 The original Purbeck marble font went to St Peter Hungate when it was a museum of church furnishings, and is probably in storage somewhere now. 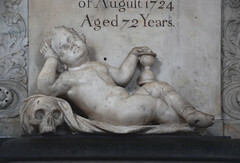 The white walls and opulent furnishings make St George a pleasant place to wander and explore the city's best collection of wall memorials of the Eighteenth and early Nineteenth Centuries. 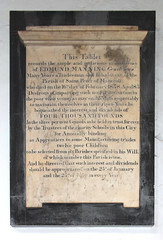 These include one to Edmund Manning, Gentleman, who, in 1838, desirous of imparting such useful instruction to the poor when young, as may enable them to respectably maintain themselves in their riper years, bequeathed the interest and dividends of Four Thousand Pounds in three percent consols to be held in trust forever by the trustees of the charity schools in this city, for annually binding as apprentices to some manufacturing trades twelve poor children to be selected from six parishes specified in his will, of which number this parish is one. This is interesting for several reasons. 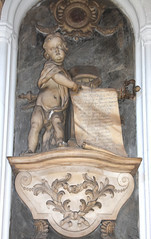 Manning's bequest was immediately after the 1834 Poor Law Act which had turned workhouses from houses of industry into places of degradation, hardship and shame. Manning obviously saw a good reason for helping the poor stay out of them. Consols, or Consolidated Stock, were a way of financing government borrowing in return for interest, and 3% consols were created by Sir Henry Pelham's Whig administration in 1757 to consolidate existing government borrowing. They continued to pay out 3% until the 1880s, and existed in a slightly different form until as late as 2015, when the Coalition Government of David Cameron paid them all back. 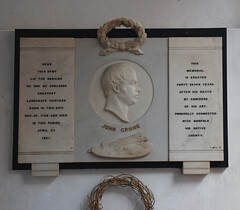 At the east end of the south aisle is the 1821 memorial to John Crome who, as the inscription reminds us, was one of England's greatest landscape painters. 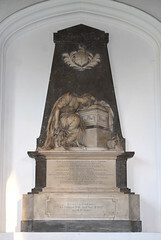 The memorial bears a relief portrait of Crome, a wreath above his head, his palette and brushes at rest below. As you wander, you will eventually find the north chancel chapel, now home to a large terracotta tomb chest and a triple figure brass. 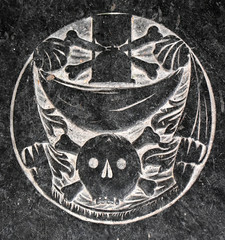 The tomb is to Robert Jannys, a Mayor of Norwich who died in 1530. 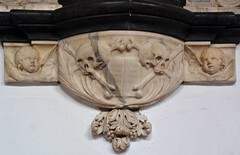 Tombs of this type are interesting, because they were produced right on the eve of the Reformation, and give us an inkling of what the English Renaissance might have been like. 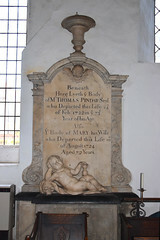 Though smaller, this recalls the Bedingfield tombs at Oxborough. Pevsner wondered if it might have been the same craftsman. 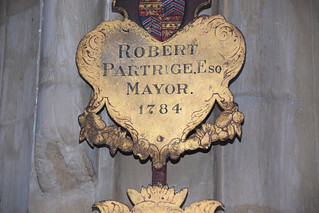 The brass depicts a Mayor from half a century earlier, the aptly named William Norwiche and his wife, with the figure of their son between them.